Four Seasons offers a wide variety of apartments and spacious floor plans, all designed to make life easier and more convenient. Our entire community is all connected and on a single level, so getting around is simple and there are no stairs or elevators to deal with. 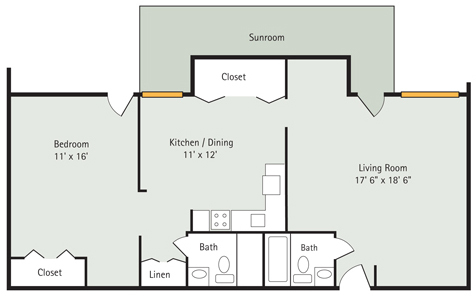 Apartments come in studio, one- or two-bedroom, open layouts as well as patios looking out on our beautiful courtyard. 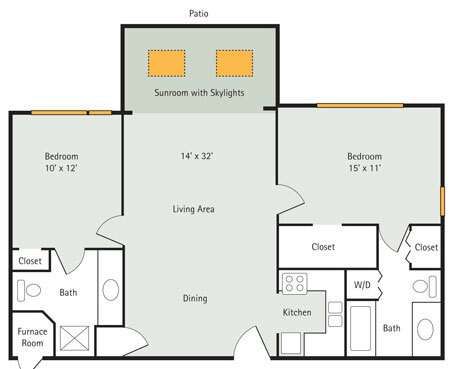 Below are floor plans showing the various spaces. 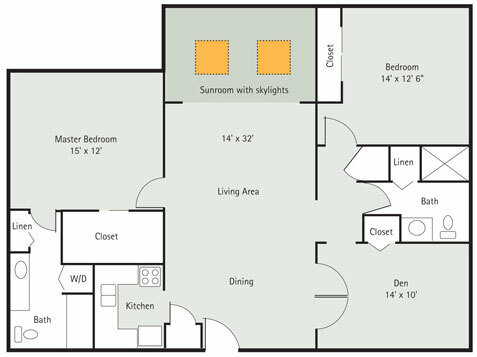 Four Season’s largest apartment has two bedrooms and a den which can be used as a sewing room, computer room, library, or guest accommodations. Spacious living and dining areas, a sunroom with skylights, two full baths, abundant closet space, and a full, modern kitchen complete this home. 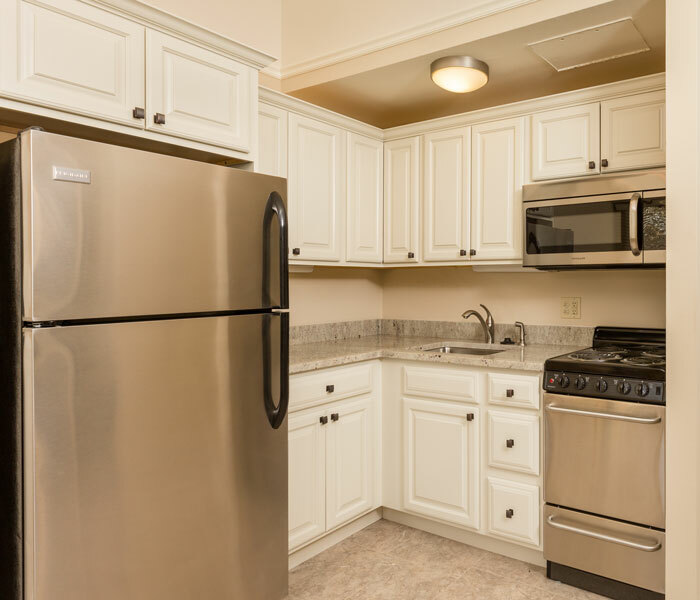 Each of the apartments is also equipped with a washer and dryer. The living and dining areas of this large apartment are enhanced by the extra space and natural light of the sunroom and its skylights. 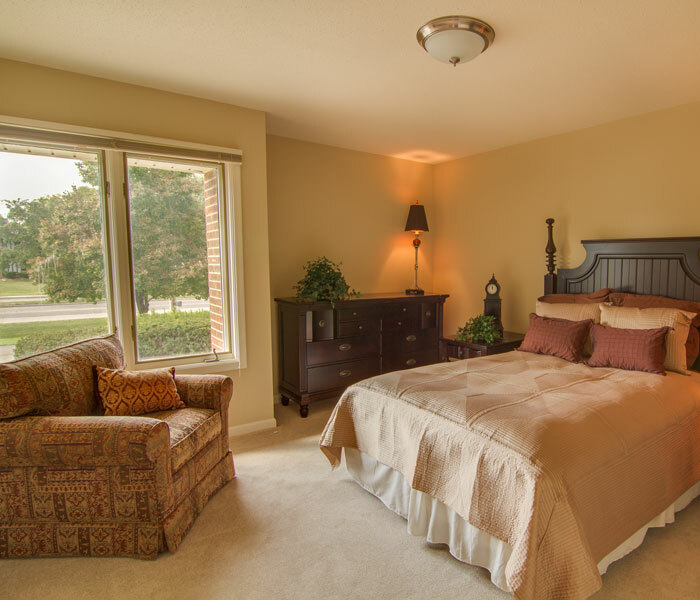 Each of the two bedrooms includes its own full bath and abundant closet space. Each of these apartments is also equipped with a washer and dryer. 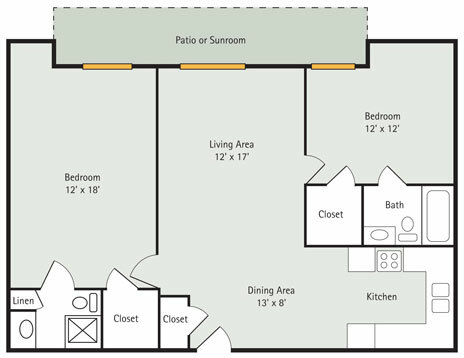 This roomy apartment offers the convenience and flexibility of two bedrooms, each with its own full bath and spacious walk-in closet. It also features a convenient dining area. 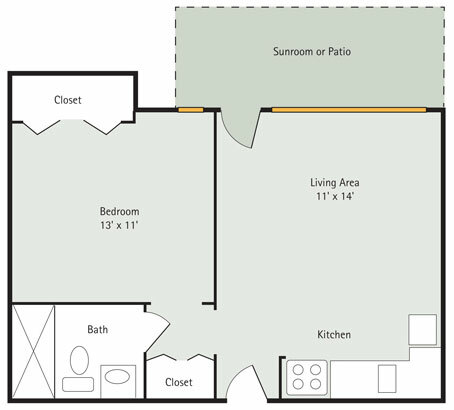 This spacious one bedroom apartment has generous closet space, two full baths, and an expanded sunroom. 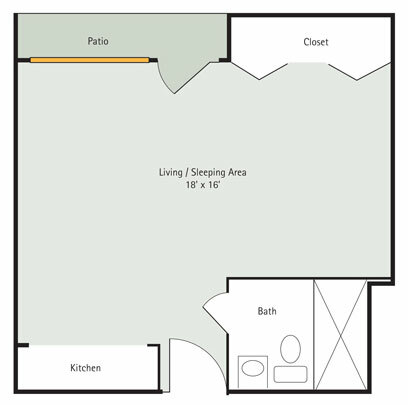 This large one bedroom apartment features good closet space, a large living room, and separate dining room or den There are several variations of this apartment. 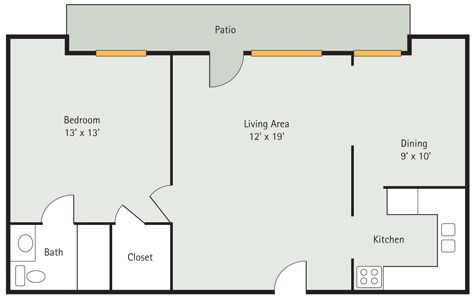 This comfortable one bedroom apartment features a very large living/dining area, plus an abundance of closet and storage space. 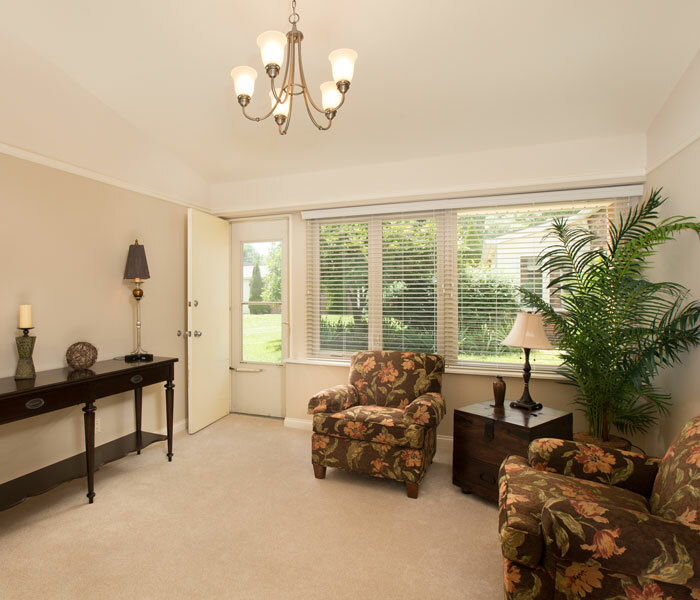 This same apartment design with a sunroom is called the “Sycamore”. This convenient apartment has a spacious bedroom to complement the kitchen and living area. 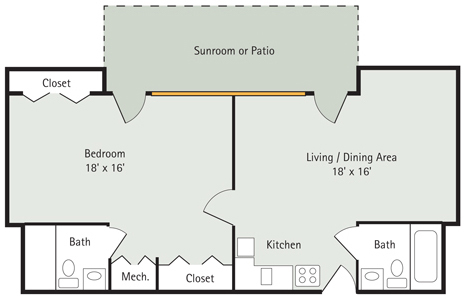 This same floor plan with a sunroom is called the “White Pine.”. The kitchen of this efficient studio apartment is equipped with a full-size stove and oven, garbage disposal, and full size refrigerator with freezer. 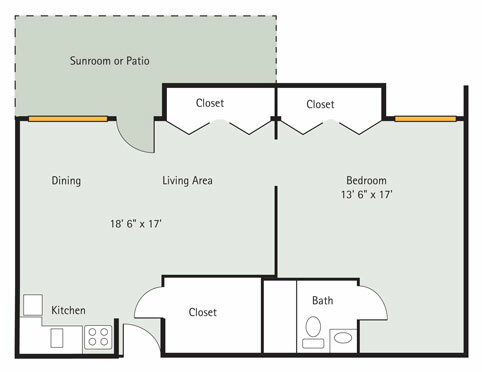 There is also a large double closet.